Norman’s pithy IMDB biog reads something like this: Height: 5′ 10″ (1.78 m). Spouse: Fi Lovett (1989 – present). 2 daughters, Lily and Kitty. Is a comedian. Orginally [sic] auditioned for the part of Rimmer in “Red Dwarf” (1988 & 1999), but was cast as the talking head of a computer called Holly instead. Was considered for the role of Zazu in The Lion King (1994). This may lead you to think that, while he seems to be leading a happy and stable family life, he hasn’t been too good at landing plum jobs in massive blockbuster feature films. Well, that’s as may be, but I feel gratified to have been at behind at least, one of his winning moves. For it was I who picked him out of a hoard of hopefuls who sent me their demos after I dished out on BBC Radio an invitation to the public to submit tapes as an audition for the final track to be added to Miniatures. On his Miniatures track, Norman impersonated, very well I thought, England’s best-loved DJ and heroically staunch supporter of all kinds of fantastic independent music (including my own Hybrid Kids), John Peel (RIP). Since his much-too-early passing in 2004, John’s family and friends have set up the John Peel Centre for Creative Arts, a thriving organisation who are, among many other worthy deeds, soon to make John’s entire, massive record collection available as an online interactive museum. Cor! 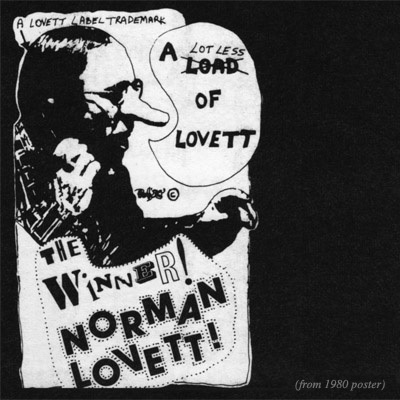 The unique thing about Norman’s miniature which sets it apart from all the others is that he broke the “fourth wall” and spoke directly to the listener about his selfishly high expectations re his appearance on this album. Norman’s cheeky yet endearing charm is that he communicates personally to his listeners rather in the manner of, say, a friendly barman. I think this cosy, matey side of this slightly surreal geezer from the penny arcade who called his own phone and answered it will be what keeps him in the public eye for many years to come, and though I haven’t yet seen them, I’m sure his two DVD’s are tons of fun. The new one, “Outside the Box,” was recorded just after Norman finished a run in Edinburgh, so he’s primed and red hot. 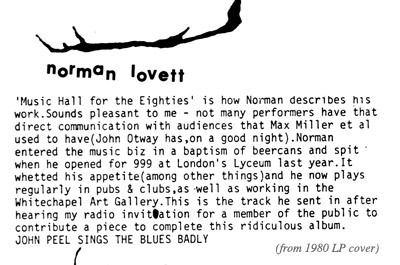 But as he says – “not that you’d notice of course; Norman’s style of laid back surrealist whimsy masks the fact that he was ‘on fire’ that night.” More of a quiet chuckle than a belly laugh, then. How very British.